Many profound and detailed admiration pieces will be written about the late Margaret Thatcher, and they’ll be much deeper than this one. But I want to get on record with my own esteem for Mrs. Thatcher, whose character, philosophy, and achievements made her one of Britain’s greatest prime ministers. Way back in the early 1990s, at a National Review conference on the eastern shore of Maryland, had the great honor to serve on an economics panel that Mrs. Thatcher moderated. (Craig Roberts was also on that panel, although I can’t remember the name of the third panelist.) The topic was free markets and freedom, areas in which Margaret Thatcher made huge contributions, so I had a lot to live up to. And how did it go? Well, following the discussion, I got to sit next to Mrs. Thatcher during the luncheon. And she told me, “You know, Kudlow, you did rather well in that talk.” Naturally, I was thrilled. 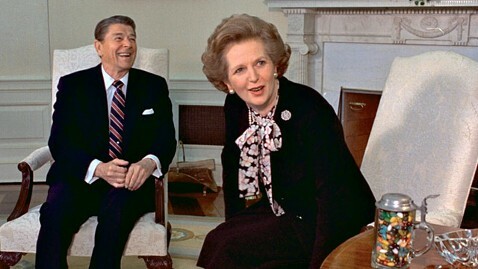 Margaret Thatcher fought socialism in England and unyieldingly promoted the free-market views of Nobelists Milton Friedman and Friedrich Hayek. She stopped the destructive British labor unions dead in their tracks. With every bone in her body she attempted to limit government by lowering spending and taxation. She opted for big-bang financial deregulation. And she put London back on the map as a world banking center. “Freedom” was always her watchword. She also adored Ronald Reagan. And the two of them formed an extraordinary partnership for freedom and free markets. Working together they helped bring down the Soviet communist system. And it was a peaceful bring-down at that. Thatcher saw Gorbachev first, and she reported to Reagan, “We can do business with him.” Reagan did, although he refused to back down on SDI. And as the American economy roared in response to Reagan’s own free-market supply-side policies, the Soviets were out-produced and eventually folded. Mrs. Thatcher famously said, “The trouble with socialists is that they always run out of other people’s money.” That dictum really stands the test of time, doesn’t it? Running out of other people’s money? Today? The age of big government has once again, at least temporarily, reared its ugly head. It’s a great battle for all the economies around the world. That’s one of many reasons why we will miss Margaret Thatcher. She did not go wobbly.